Have you ever been blamed, undeservedly, for something you didn’t do? I wonder if that happened to the infamous innkeeper, the villain of many Christmas pagaents, who callously denies shelter to the Holy Family. This innkeeper probably never really existed. Why? However, that is not the Greek word used for “inn” in Luke 2:7. That word is κατάλυμα (katalyma). This place for the lodging of travelers is in a family home, either a guest room or place on the roof. In Luke 22:11, Paul also uses katalyma for the “upper room,” the guest room used for the Last Supper. The law of hospitality was strong in ancient times, as it is still today in the Near East. Travelers would often stop at the city gate, hoping for an invitation to stay in someone’s home. The practice is even stronger for family members. Joseph and Mary were returning to their ancestral village and no doubt had many relatives living there. However, many other family members also had to return to Bethlehem to register for the census, so there was no place for them in the “inn” or guest room. No doubt the main house was wall-to-wall people. So where could the young couple stay? Whatever the identity of the innkeeper, he/she showed caring discretion, not careless disregard. Typically, public inns were uncomfortable, dangerous and pest-infested. No one would want to deliver a baby in a crowded room with a bunch of strangers, especially in a place full of camel drivers. So if this innkeeper did exist, he compassionately found another place, more secluded, for the impending birth. If Joseph and Mary stayed with relatives, their home was certainly crowded with others who had to register. In a traditional Jewish home, the family and guests slept on the second floor and the roof, while the animals were kept in the courtyard on the first floor. The young couple may have stayed in this area, using the feeding trough for a crib. However, early tradition, at least from the early second century A.D., places the birth in a cave used to shelter livestock. Bethlehem and the surrounding area is honeycombed with caves, and they are often used to pen livestock at night. The family home in Bethlehem may have been built over such a cave, which then provided the privacy Mary needed for the delivery. 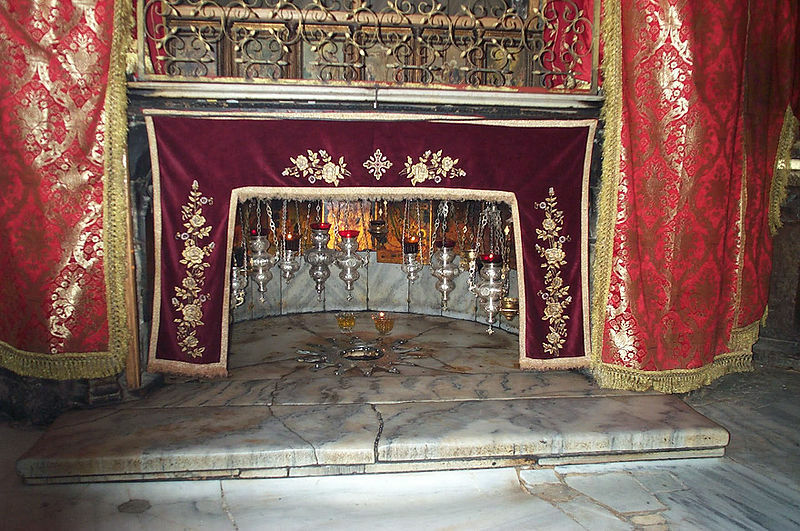 The Church of the Nativity in Bethlehem is built upon the site of one such cave. Often we must improvise and make the best out of a difficult situation. Whoever the “innkeeper” was, he/she showed consideration for the privacy needs of the couple and gave them the best accommodations possible under the circumstances. Did you ever have unexpected company? When I was growing up, my mother had a code word for such situations when she didn’t think the meal would stretch far enough – “FHB,” which meant “family hold back.” I still keep a futon, blow up mattress and extra bedding, just in case. Does your family have any standard arrangements for unplanned arrivals? How can you plan for such occasions so your guests will feel welcome?